This Summer Onetangi has become Waiheke's hotspot. 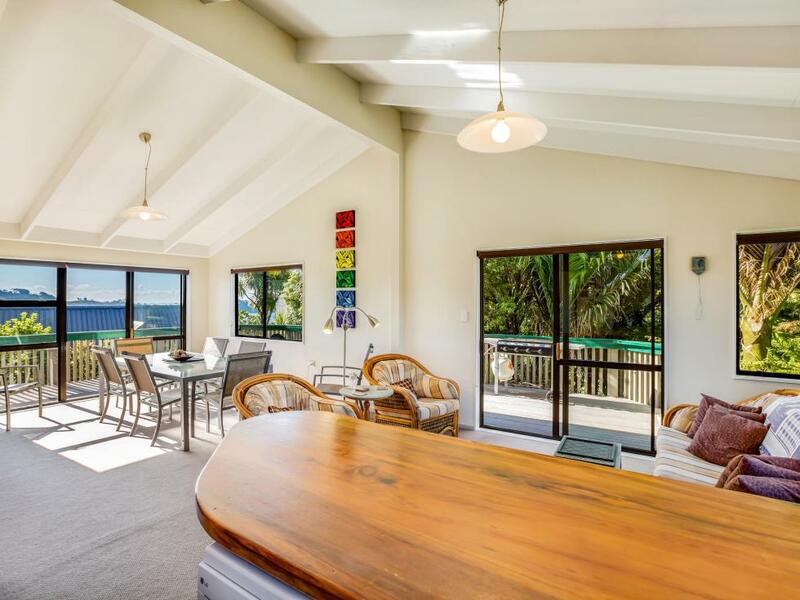 Seldom do offerings become available on the sought after eastern end of Onetangi. Seep in water and white sand view shafts. Large, relaxed easy living is on offer here- all wrapped up at this address in a wonderful four bedroom package. Set atop a large site, this spacious home is laid out to optimize open-plan living and entertaining on the top floor, set off with high ceilings, wrap around decks and views. If it's all day sun you are after look no further, be the last in the bay to see the sun set! Private and elevated from the road access is hassle-free via a good concrete drive with turn-around room and off street parking for three. Plenty of room to store the water toys if needed. This immaculate north side property has been very well cared for and is in tip top condition, but there is easily room to stamp your own taste and style on it. A visit down to the beach, offers the choice of three restaurants while the best dining vineyards are a few minutes' drive away. Excellent value combining utility, space, ambiance, location and potential. Call for an appointment to view now.